Today we did a ride with two significant climbs — Old La Honda and Alpine. We did this ride once three years ago and it kicked our butts pretty hard. We were interested to see how it felt now. Hopefully we’re stronger bikers, but we’re pulling a trailer. The first climb (Old La Honda) went pretty well. Anne pulled, and though she stopped to breathe a couple of times, she made it to the top like a champ. This is a pretty well known climb, so there were lots of other bikers offering encouragement. There was even some cheering at the top from some people waiting for the rest of their group. The descent on the other side of Old La Honda was quite nice. The road surface wasn’t ideal (chip seal, but with fairly small aggregate), but the views were amazing, and it’s much lower traffic (both for bikes and cars) than the way up. We stopped for lunch in La Honda at the bottom. Ruth had fun running laps around the parked bikes and eating cookies. When it was time to go, I accidentally pinched her chin with the helmet buckle. There were some tears, but Mommy fixed her up with about 10 seconds of cuddles, and off we went. After just a few fairly flat miles, it was time to start the climb up Alpine. I was pulling at this point. Alpine is both longer and taller than Old La Honda, and I was having a really hard time pulling the trailer. After several breathing stops, somewhere around the halfway point, I asked Anne to take another turn. She pointed out that whoever had the trailer at the top got all the glory — but somehow that didn’t seem to matter very much. Before we summited, we swapped again anyways. By the time we got to Skyline at the top, we had run out of water. My cue sheet claimed that there was a nature center with a fountain, but it wasn’t jumping out at us. We asked another biker, Bob, and he said he could show us a fountain just down the road that some nice property owner put in. I tried to keep up with him and chatted a bit. Ruth played with the fountain and made a nice mud puddle to stomp around in. She got to go barefoot for the rest of the ride. The descent down Page Mill (the other side of Alpine) is scary. Fairly steep, lots of blind turns, and pretty heavy car traffic. About halfway down my brakes started making a different sound, so I decided it was time to let them cool off. Fortunately, closer to the bottom is started to get straighter, so I could let loose a bit. I heard a lot of “down down down” and “fast” from the trailer. Even after the big climbs were done, there was a fair amount of small hills to go over. I was really pooping out, so I tricked Anne into taking another turn. 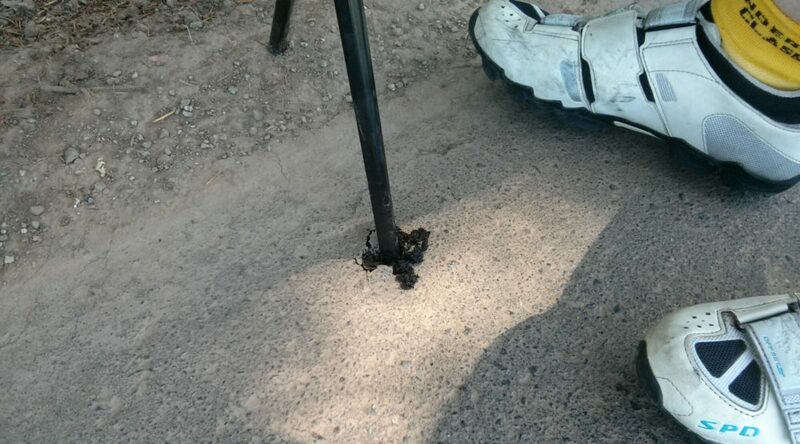 While we were stopped, Anne’s kickstand poked a hole through the road. Remind me not to let her park on my foot. Our timing this time with the trailer was almost the same as the last time we did the loop. Old La Honda was a few minutes slower, Alpine a few minutes faster. I feel a lot better this time than last time — although last time we got a really late start and didn’t get back to the car until almost two hours past sunset, I had forgotten to bring a headlight, and Anne’s headlight almost ran out of juice. Animal sightings: Deer, horses, peacock (heard only), a rooster, several small lizards with a deathwish, a caterpillar, and a couple dogs in the back of pickups. Day two of the bikestravaganza went well. This was Primavera, an organized ride put on by the local cycling club. Last time we did the ride it was rainy, windy, cold, and kind of miserable. We didn’t have any rain gear, so the day before we wet to REI and went to town. This time it was hot and sunny. I took the trailer until the first rest stop, halfway up the big climb. I ended up needing to stop once for breath, but managed to make it. Then Anne took Ruth for the second half of the climb, including the short but steep section known as “The Wall”. She ended up walking part of the way, but even so I didn’t beat her to the top by much. 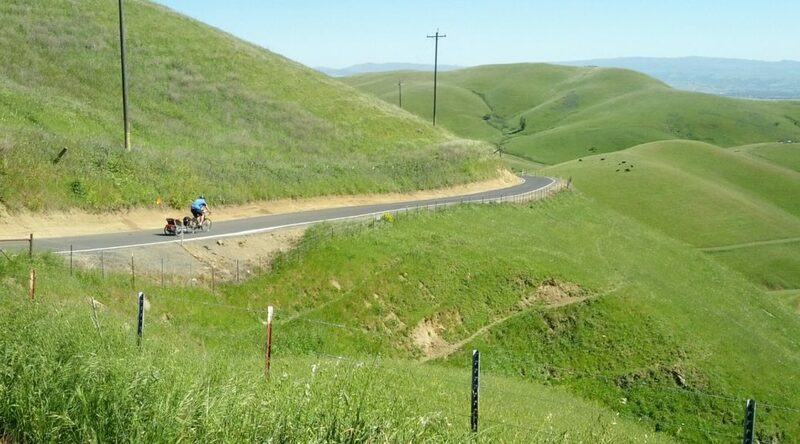 Then we rode along the far side of the hills east of Fremont, overlooking the Calaveras Reservoir and Valley. It’s crazy that this is just a few miles from home. We had to bribe Ruth with a cookie in order to get her to put the helmet back on after the second rest stop, but she seemed happy in the trailer. I should have had another cookie too, since I started loosing steam in the last couple of miles. At the finish they had lasagna, hot dogs, and ice cream, so I survived. Animal sightings: cows (way down in the valley), horses, roosters (heard, but not seen), some wild turkeys, a “sleeping” deer, two dogs (at the rest stops), and a motorcycle gang. Most interesting roadside debris: A biker relaxing on an embankment within the first 10 miles of the ride. This was the first day of our bikestravaganza weekend — two full sized rides in two days, to start getting used to longer rides for our planned tour in the summer. 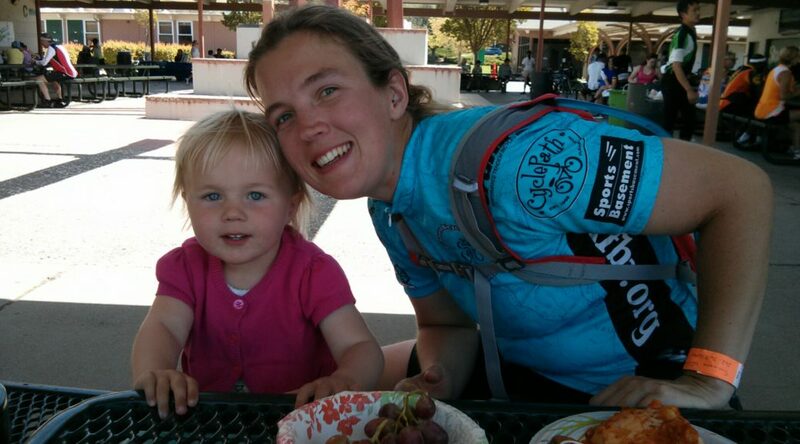 This was also Anne’s first real ride with her new Surly Disc Trucker. She picked it up from the shop yesterday. Sounds a more womanly seat is in order, but otherwise she’s happy. Going up the big hill was tough with the kiddie trailer. Fortunately, just when I thought I was about to die, Anne offer to take it. Haha, sucker. Of course, I finished the climb still thinking I was going to die, just with a lighter load. There was a Team in Training group that passed us on the way up, but at least they were impress at us dragging up the trailer. The descent was fun, as always. Some blind turns, but not much traffic. Ruth had fun with water. At some point we let her keep one of our water bottles with her in the trailer. When we next checked on her, she had squeezed the entire bottle out onto her pants and the bottle of the trailer. Anne had the bright idea of using a diaper to soak up the water. Then, at the park at the top of the climb, she thoroughly soaked herself with the doggy faucet. It was a hot day, so we just let it be. Animal sightings: cows, horses, a chicken, a turkey, a turkey vulture, a red winged black bird, ducks, ponies, and a snake trying to get out of a canal. Most interesting roadside debris: A silk blouse.